Spend all your available magicka to play Dragon Cult Ghost. Its power and health are equal to the magicka spent. Dragon Cult Ghost is an epic Endurance creature card. It is part of the Heroes of Skyrim expansion. 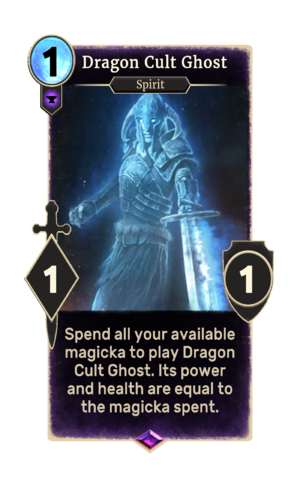 In addition to the card's availability in the Heroes of Skyrim expansion, one copy is included in the Alduin's Apocalypse theme deck. Dragon Cult Ghosts appeared in Skyrim. Its ability will only trigger if summoned from hand. If summoned by any other means, it will always be a 1/1 for 1, and even if it enters play as something else, it will enter the discard pile at its default stats. This page was last modified on 27 February 2019, at 00:56.